Silky smooth and luxuriously light, this pistachio cream filling is simply divine! 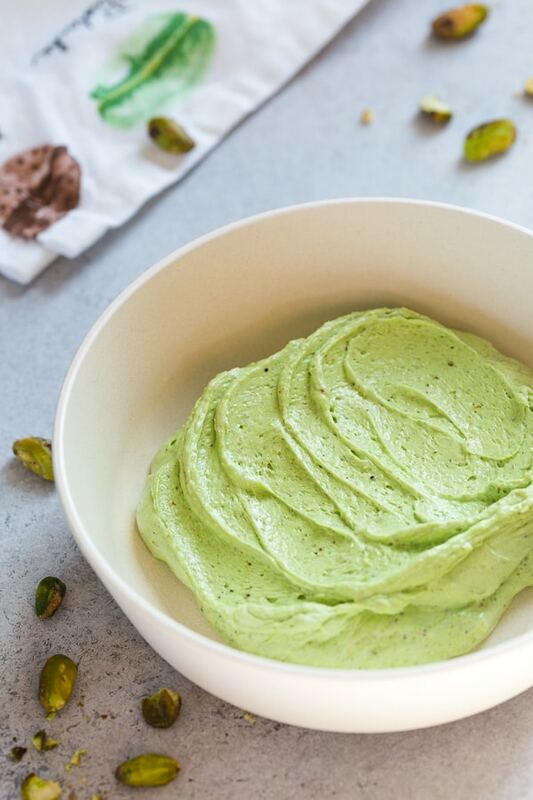 Though it requires an advance technique, this pistachio cream is so worth the effort. It’s a perfect filling for pistachio macarons, but it also pipes beautifully on cupcakes and cakes! I think I’ve mentioned one too many times that I’m not really a big fan of classic American buttercream with powdered sugar. That’s why I don’t hesitate to take an extra step to make a batch of Swiss Meringue buttercream. Or if I’m short on time, my go-to frosting is this easy cream cheese frosting. And today I’m going to share with you another wonderful buttercream recipe that you’ll fall in love from first bite. Ready to expand your buttercream experience? Meet silky smooth, luxuriously light French buttercream. 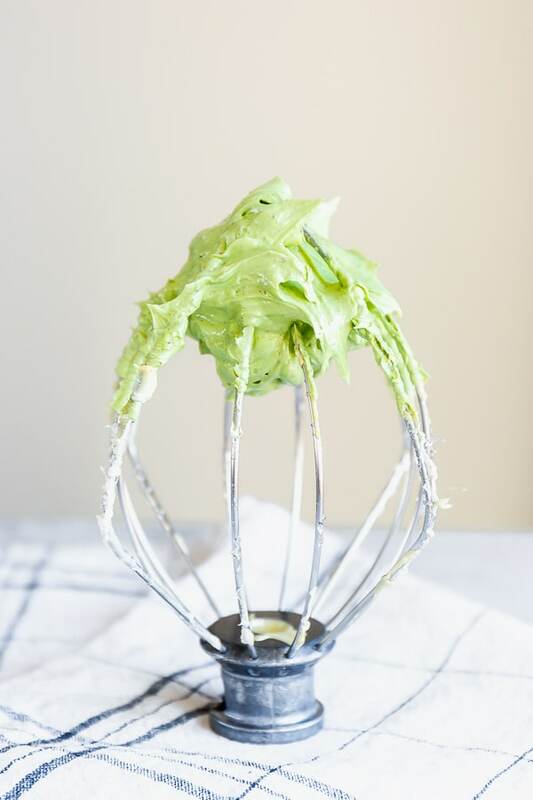 And with pistachio paste, this pistachio cream becomes an ultimate frosting/filling of all times! WHAT IS THE DIFFERENCE BETWEEN FRENCH BUTTERCREAM AND SWISS BUTTERCREAM? Swiss (or Italian) meringue buttercream recipes are based on meringue made with egg whites and sugar syrup. French buttercream, on other hand, is made with egg yolks and sugar syrup, and then butter added into the mix later. Frankly, this is not a simple recipe, in fact it requires an advanced technique: sugar syrup! BUT it’s totally worth the effort. This pistachio cream is rich and luxuriously creamy. Since the original recipe makes bigger batch than I need for my basic macaron shells recipe, I adapted the amounts to make just enough filling for my macaron recipe. But if you need more filling for cupcakes, for example, feel free to double the recipe. As I mentioned above, this recipe requires an advance technique and precision for success! But equipped with proper tools and constant attention, this pistachio cream filling comes together quite quickly. Make sure to cook the sugar syrup to proper temperature. Cook it too short and your buttercream won’t set properly. Cook it for too long and you’ll end up with a rock sugar instead of buttercream. Sugar syrup should reach firm ball stage, which is 245-250°F. And make sure it doesn’t go over 250°F, or it’ll start turning amber color. 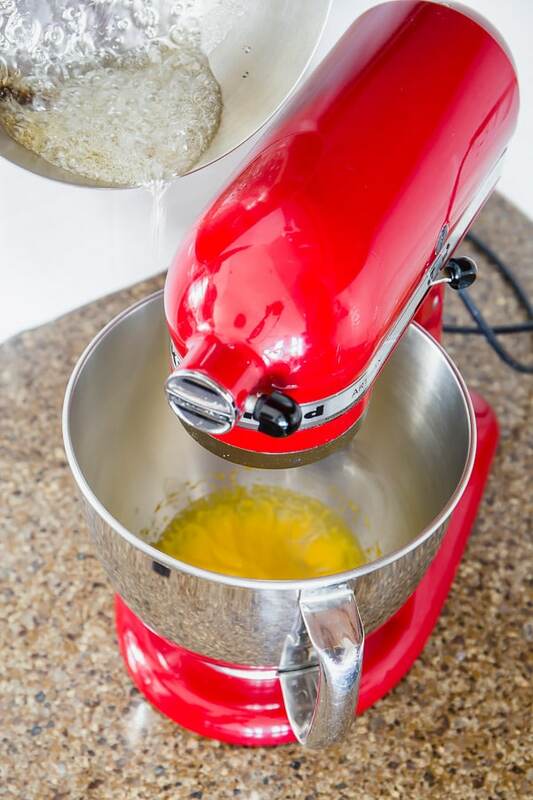 It’s best if your mixer is placed near the stove, as you’ll work simultaneously on cooking the syrup to correct temperature and whipping the egg yolks. Stand mixer is highly recommended. 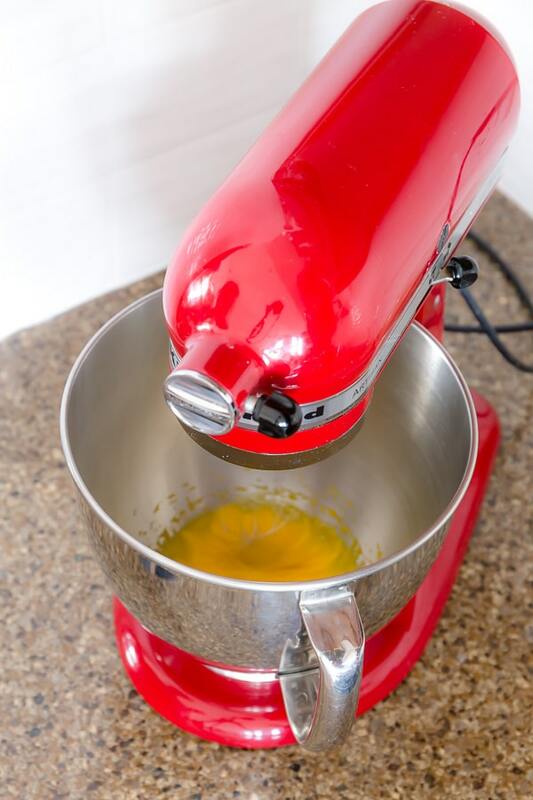 It’s much easier to work with stand mixer, because we need to pour hot sugar syrup into whipped egg yolks very slowly while the mixer is running! It’s important to pour the sugar syrup in a very thin stream. If poured too much, sugar syrup hardens as it hits the bowl and turns into a rock candy. Soften the butter to room temperature. It shouldn’t be too soft, or about to melt. Here’s what room temperature butter means. Remember, speed and attention is key to success. And now, here are step by step photos to guide you through the process. For accuracy, use a candy or any thermometer to monitor the temperature of the sugar syrup. Whip the egg yolks until it’s doubled in size and tuns into pale yellow mixture. Be very careful when you pour hot syrup into the beating egg yolks. Decrease the speed to medium low, and pour into the side of the bowl, instead of whisk, to prevent splattering. And remember, very thin stream, especially in the beginning! Once all the syrup poured in, increase the speed and whip until the mixture is cooled down. And then add butter a little bit at a time. If you add the butter into too warm mixture, your filling will turn into a soup, because butter will melt. Also, let me share couple tips to get that beautiful vibrant green color. Use quality pistachio paste. I know, it’s not cheap. 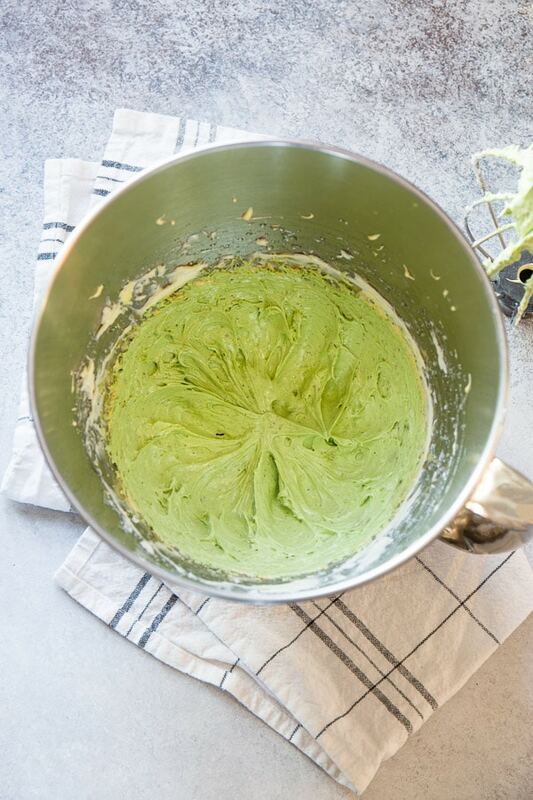 But you can save some $$ if you make this simple homemade pistachio paste. Add a tiny bit of food coloring. I use this gel food coloring from AmeriColor. Issue: The sugar syrup turned into rock candy when poured into egg yolks. Make sure the sugar syrup wasn’t over-cooked, meaning it didn’t go over 250°F. When in doubt, remove from heat when it reaches 245°F. And immediately pour it into the egg yolks. Make sure to pour sugar syrup in a very thin stream, especially at the beginning. Make sure egg yolks are at room temperature and whipped till light pale. Issue: My French buttercream is too runny. 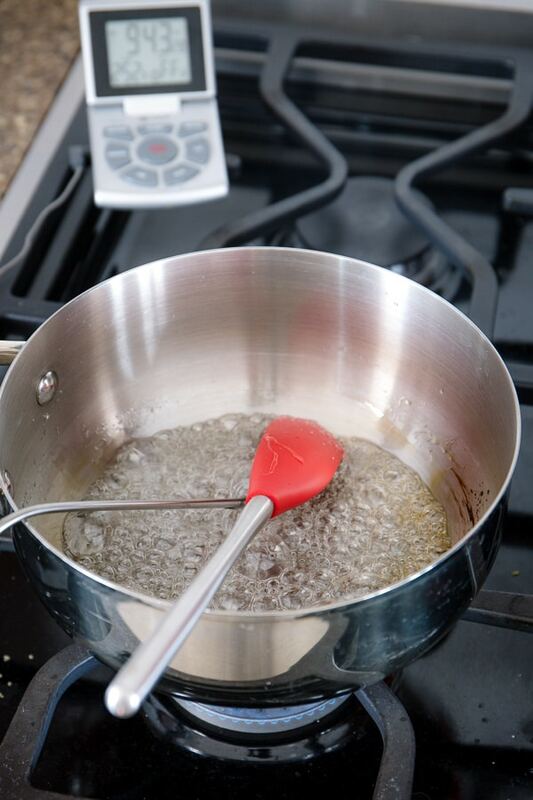 Make sure to cook the sugar syrup reaches at least 245°F (118°C). If it doesn’t reach firm-ball stage, buttercream won’t set properly. 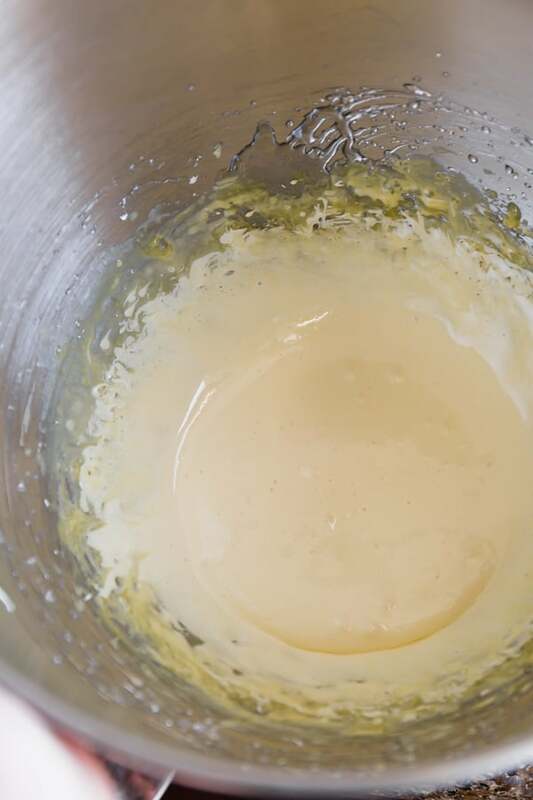 Make sure to whip the egg yolks with sugar syrup until it reaches at least 104°F (40°C) before adding butter. If the mixture is too hot, butter melts and creates a runny buttercream. Silky smooth and luxurious, this pistachio cream filling is simply divine! 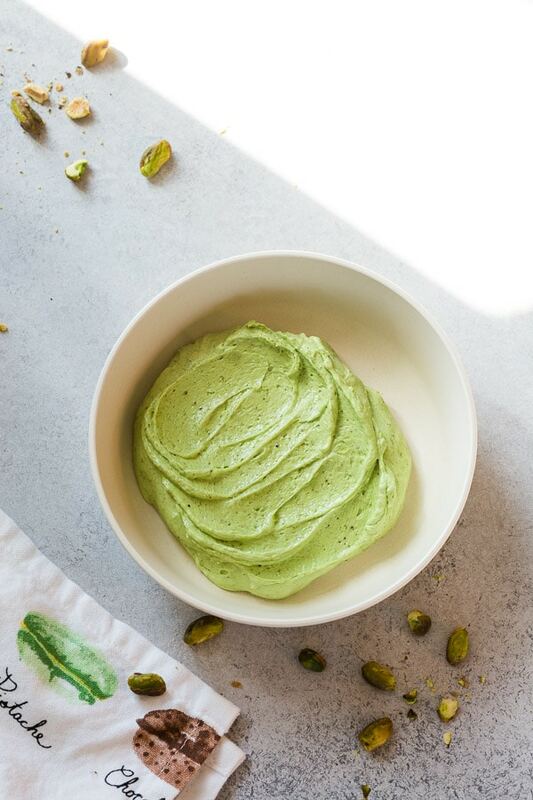 Though it requires an advance technique, this pistachio cream is so worth the effort. Use high quality butter and pistachio paste for the best result. It’s a perfect filling for pistachio macarons! In a small saucepan, combine sugar and water. Bring it to a boil over medium heat, stirring it constantly until sugar is completely dissolved. Then continue to cook until the syrup reaches 250°F (120°C), about 5 minutes. Simultaneously, start beating egg yolks in a mixing bowl with whisk attachment until it’s doubled in size and becomes pale in color, about 2 minutes. While the mixer is running on low speed, slowly pour the hot syrup into the egg yolks. Pour the syrup into the side of the bowl, instead of the whisk, so that it doesn’t splatter. Increase the speed to medium high, and beat the mixture until it cools down to 104°F (40°C). The mixture will become smooth and white. Stir in butter one tablespoon at a time. Then add pistachio paste and food coloring, if desired. Continue to beat the cream until nice and smooth. Slightly adapted from Ladurée Macarons.